UHS PRUITT: A Southeast Regional Leader In Long-Term Health Care, Needed A Platform To Cross Sell Their Services While Meeting Customer’s Needs For Resources And Information. UHS-Pruitt needed to create individual solutions and online access to available resources for customers, while cross-selling new and related services. We developed an online solutions finder and touchscreen user interface that allows visitors to self-identify their needs, directing them to a custom solutions page that cross sells services specific to their needs. 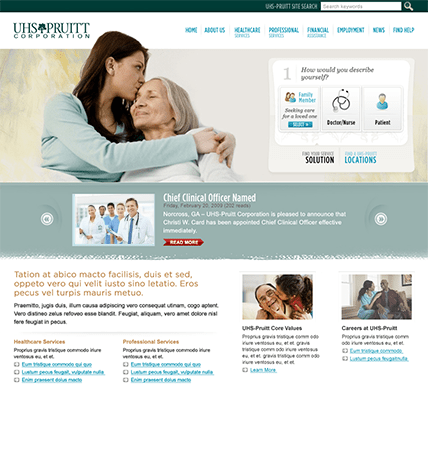 The new solution finder connected more than 40 percent of visitors to related UHS Pruitt services, making the website a useful tool for customers in need and re-enforcing the company as a leader in caring, dedicated and personally relevant long-term health services.